ken けん, tsuma つま, and karami 辛み, 辛味, 辛み. These items are arranged behind and below the fish. The most common name is KEN, but the others are now also used. KEN contains finely chopped vegetables like radish, cucumbers, carrots, cabbage, myoga and udo. The stripes are washed in icewater for a while and then placed on the plate. They function to get rid of the aftertaste before taking a new, different bite. Some also have a desinfectant function or reduce the "raw" taste of raw fish. These are often piled up in the back, behind the fish pieces. When they are placed below it, we call it shikizuma 敷きづま. Ken may therefore also be counted as a kind of TSUMA / zuma. Vegetables cut in the direction of its fibers are called tateken 縦けん. Those cut in a right angle to the fibers are called yokoken 横けん. TSUMA literally" wife", is like a good wife to the taste of the original sashimi. It should support it and enhance it and add to its enjoyment. It contains a kind of perilla, shiso 穂じそ and others. ..... aome アオメ buds of green shiso. ..... murame ムラメ buds of red shiso. bakudaikai 莫大海（ばくだいかい) dry fruit of the Vietnamese oak tree. other dry fruits can be used. The young leaves have a red color. Also served with tai dishes. boofuu 防風 Chinese herb of the sellery family. Its stem has the form of an anchor of a ship, when you cut the stem with a sharp knife and looks pleasing. buds of special beans, a speciality of Tokushima. tara no me, young sprouts of tara, たらの木. Tsuma is also added to soups, wanzuma 椀ずま. They serve to show the season. KARAMI contains wasabi or other "HOT　or pungent" items of this kind. Seaweed and algae are also used for garnish. General name for red algae (koosoo 紅藻). It gives food a special taste and prevents fast rotting in summer. Zum Sashimi und Tempura gegessen. Auch "grosses Blatt" ooba 大葉（おおば） genannt. The name comes from a Chinese legend. Once there was a boy with food poisoning. He drank some liquid made from boiled red shiso leaves and came back (蘇, yomigaeru ）from the dead (shi). Perilla frutescens ist eine aus dem asiatischen Raum stammende Heil- und Gewürzpflanze, die dort vor allem als Lebensmittel, aber auch wegen ihrer gesundheitsfördernden Eigenschaften geschätzt wird. Perilla wird zur Zubereitung von Fisch- und Fleischgerichten sowie als Beigabe zu Gemüse verwendet. In der traditionellen chinesischen Medizin wird Perilla seit Jahrhunderten als schleimlösendes Husten- und Asthmamittel angewandt. Neben ihren gesundheitlichen Wirkungen ist Perilla frutescens wegen ihres zitronenartigen, süßlichen Geschmacks aber auch eine interessante Bereicherung für die moderne Küche. Die Pflanze kann ähnlich vielfältig wie Basilikum verwendet werden. to prepare umeboshi pickled plums. Dried leaves are added to shichimi toogarashi hot pepper mix in Kyoto. Also in furikake. Die Blätter sind ein orientalisches Gewürz und werden wie Petersilie verwendet. Diluted as a summer drink or as dressing for salads. It smells quite different from shiso Perilla. The seeds are often used to make egoma oil 荏胡麻油. The leaves are eaten as a vegetable. Since it grows like a weed, it was very useful for farmers of old times to get over times of famine.
. yudan taiteki 油断大敵 Do not be inattentive. .
and the oil from egoma ! a mountain plant which produces fat, white, edible stalks. 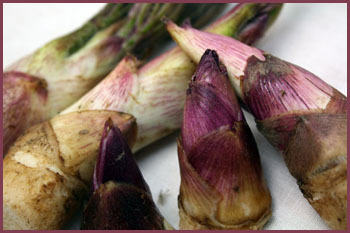 Its tender stalks are similar to asparagus, their flavor is a light fennel. Udo cen be used raw in salads or slightly cooked in soups and other dishes. of aralia buds . . . Written after 1688 貞亨元年, Basho around 41 to 51.
the buds of aralia are a harbinger of spring. Use KIGO as if they were the tsuma of a sashimi. Some advise of Japanese haiku teachers.
. Ginger, Ingwer (jinjaa, shooga 生姜 ) . This was a farming region, mostly for egoma 荏胡麻 a kind of perilla. egoma no hara . . . ehara . . . Ebara. In 1927, the village 荏原町 Ebara Machi was founded. Ebaramachi station is in 5-2-1 Nakanobu, Shinagawa, Tokyo. The parts of Ebara now are located in Shinagawa, Ota, Meguro and Setagaya ward.